The type of vehicle you drive has a significant impact on how much you pay for insurance. Here's why different vehicles can have significantly different rates. Higher-priced models cost more to replace if the vehicle is destroyed, considered a total loss. Claims of this nature could be either comprehensive (fire, theft, flood, or hail) or collision (impact or rollover). If you drive a high-priced vehicle, your insurance company will have to pay out more to replace your vehicle. This means higher comprehensive and collision rates on your policy. If you have a claim and your vehicle is not a total loss, your insurance company will pay to have it repaired if you have full coverage. High-priced vehicles tend to have more expensive replacement parts, and may also require repairs to be done by a specific (and more expensive) dealer collision repair center. This also translates into higher insurance costs. Vehicles with safety features like automatic braking, lane departure warning, blind spot monitors, and traction control have reduced frequency of claims. Drivers will pay reduced rates for both physical damage coverage and liability when insuring a vehicle with these options. Insurance companies track both frequency and severity of liability claims for all vehicles. Models that have a tendency to have more frequent or more severe claims for bodily injury or property damage liability will have higher liability insurance rates. This is especially seen on larger 3/4 ton and 1-ton pickup trucks, which have some of the highest liability rates. The performance level of your vehicle will also have an impact on rates. 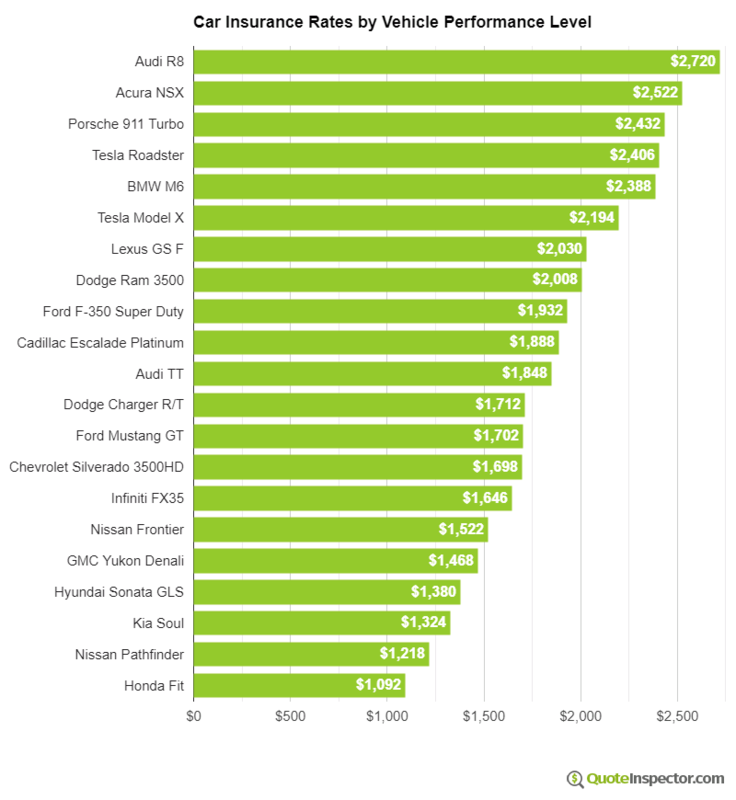 Higher performance vehicles not only cost more, but accidents tend to be more severe than lower-performance vehicles. This tends to push collision rates higher on vehicles that have above average horsepower or acceleration. The chart below demonstrates how performance level and liability rating can affect insurance prices.